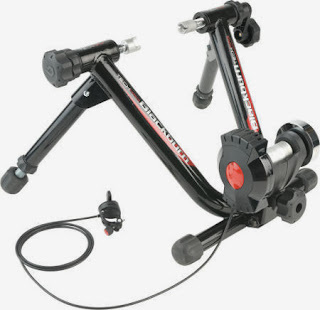 Century Cycles Blog: 30% OFF a Blackburn Indoor Trainer - Hot Deals for Cold Days are Back by Popular Demand! 30% OFF a Blackburn Indoor Trainer - Hot Deals for Cold Days are Back by Popular Demand! Every winter, we negotiate special purchases from our manufacturers for the most popular bicycling accessories, then we pass the savings (30%-50% off) to YOU! A new "Hot Deals for Cold Days" offer comes out every two weeks, now through February. Stock up on essentials, shop for the holidays, and save on your cycling favorites! The Blackburn Tech Mag 6 features a sturdy steel frame and a silky-smooth magnetic resistance unit with 6 settings that are select-able with a handlebar-mounted remote. It's ideal for use with your bicycle in your own home, for indoor cycling classes where you bring your own bike and trainer, or for taking to a race or event to warm up. This Hot Deal is good only November 19 - December 2, 2015, while supplies last on in-stock merchandise only. In-store purchase only; no online or phone orders accepted. No coupon necessary.